After booking the most exquisite venue, the best photographer, the top florist and the hippest band— are you still looking for something truly unique for your wedding? Live event painting is a trend that has been on the rise for years, yet is still largely unknown to most people and even many event planners. 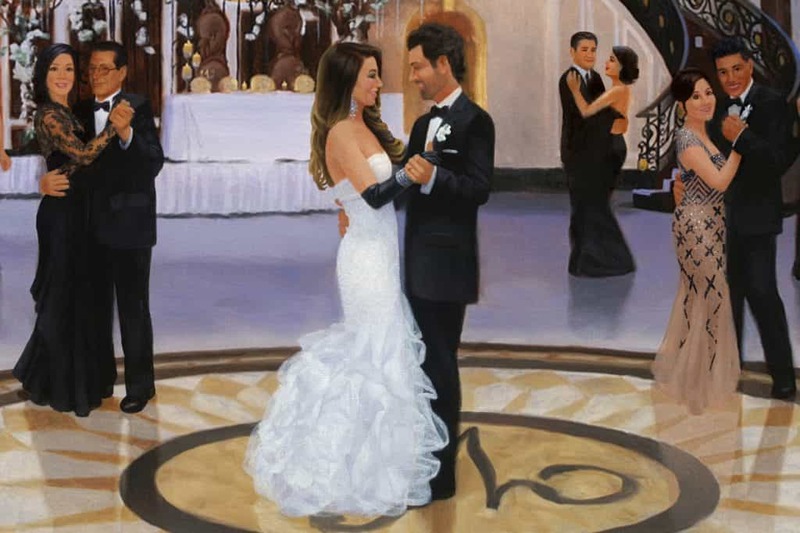 As your guests make their entrance to your reception, taking in the stunning lighting and the various touches enhancing the beauty of the room, they will be pleasantly surprised to find a wedding artist recording it all in an original oil painting. Having the opportunity to watch the making of art is always an exciting and crowd-pleasing form of unique entertainment for guests. As the painting comes to life, they are free to come back and see the progress of the painting as many times as they like throughout the night. The room or scene will be depicted as well as a portion of the guests. The married couple will be highlighted as the focus of the entire painting, and their faces will be painted with recognizable likenesses. 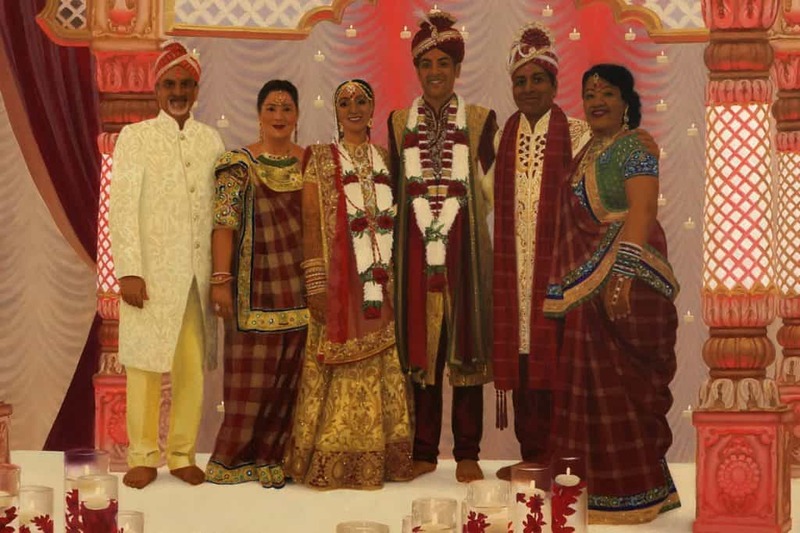 You may choose a few family members and friends to be included as they watch the first dance at the edge of the dance floor or dance alongside the couple. One area that my paintings stand out is their level of detail and realism. Past clients have said that the way I captured the feeling of the night brought them back to the day of the celebration better than any of the photos. Your painting will be a beautiful family heirloom to be passed down for generations. In addition to being a live event painter, I am an award-winning full-time artist with experience creating traditional portraits, figural work and landscapes. Elements of each of these things can be seen in live event paintings. I graduated with honours from Temple University's Tyler School of Art. My art has been shown across the United States, and I have work in private collections in The United Kingdom and Singapore. 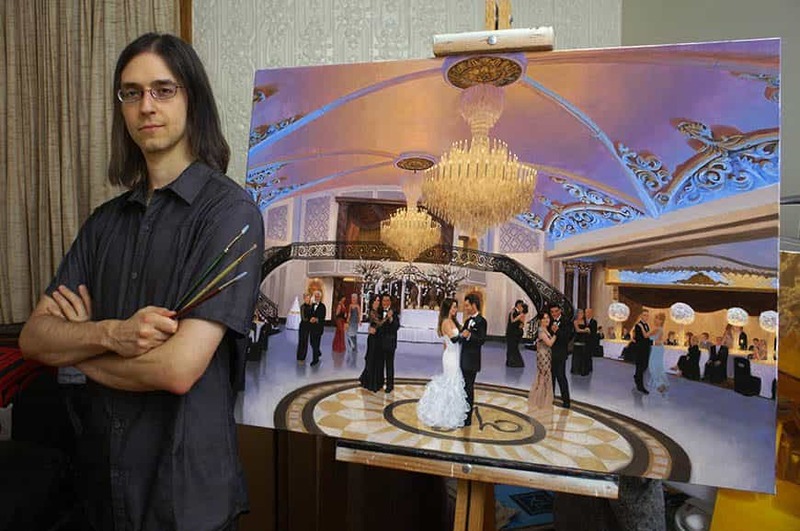 My studio is in New Jersey, U.S.A., but I am happy to travel anywhere worldwide to paint your lovely event. My goal with each of my clients is for them to be as satisfied with the painting of their special day as they are with the person that they chose to share it with. Anthony was hired for my friends' wedding and the picture he painted was just so impressive that i took his name for my wedding. I cant wait to see what he does!!! Thank you so much for the review Joele! Which of your friends did I do a painting for?